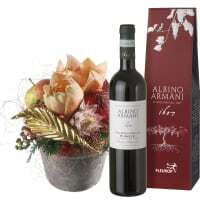 Keen to know more about our red wines by Albino Armani? 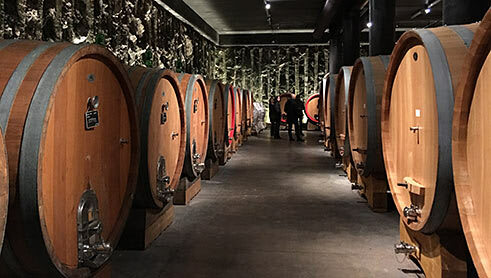 About Amarone and Ripasso, the production methods, the grape dehydration process then and now, the right choice of wine glass, the right amount of wine to serve, caraffing, decanting, wine temperature, chambering and rapid cooling? Click on any of the titles below and read on - enjoy! How full should one fill a wine glass? Chambering – even when time is short! 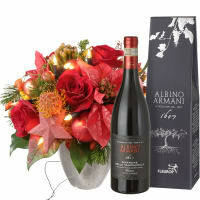 This full-bodied Amarone della Valpolicella Classico DOCG comes from Albino Armani’s winery in Marano. 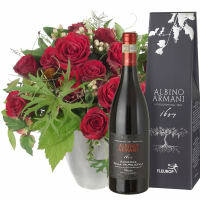 It is a deep ruby red, very complex in the nose, with a broad range of aromas evocative of ripe red fruits and spices. It is flavoursome with an excellent structure. Served at 16-18 °C it is perfect with substantial or even hearty dishes such as braised beef, game, stews and roasts, but also goes well with raw ham, Bresaola, Coppa or even salami, mature cheese and typical national dishes such as “pasta e fagioli” or “Risotto all’Amarone”. 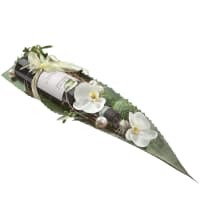 Its luscious aromas and fragrances place it amongst the favourites of many a wine connoisseur. 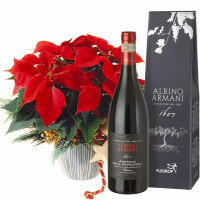 The grapes required for this wine are cultivated in the hilly and mountainous Valpolicella region around Marano. 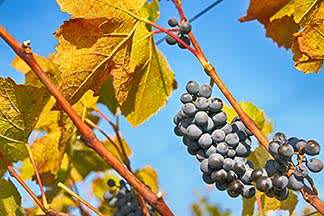 Amarone is special in that it is made from dehydrated grapes (see below to find out more). 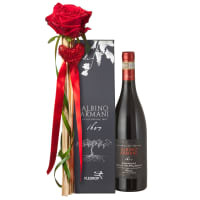 It is widely regarded as one of the most intense, highest quality red wines produced anywhere in the world and is featured in the most prestigious wine guides such as Vini d’Italia Gambero Rosso, Veronelli, Luca Maroni, Enogea and Wine Enthusiast. 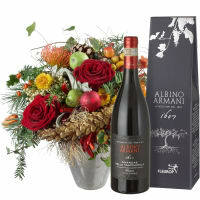 Flowers & Amarone: visit the Shop HERE. 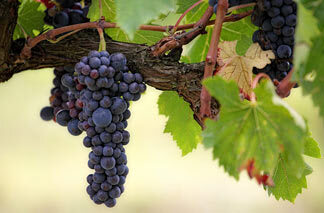 Ripasso wine is also referred to as the Amarone’s “little brother”. Roughly translated, the term “ripasso” means something like “second passing”, and that is exactly what happens with the young fermented Valpolicella, which is subsequently added to the fermenting marc recovered from the Amarone production process. This triggers a second fermentation which gives the Ripasso a fuller, darker, more complex character as the pleasing qualities of a Valpolicella combine with the richness of an Amarone. 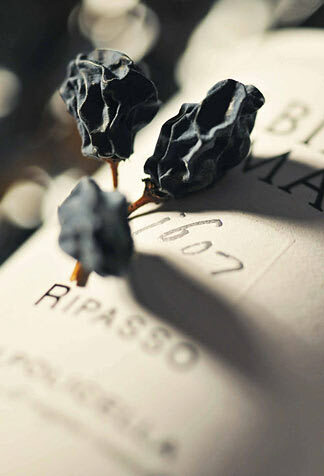 Ripasso has an intense red colour with an elegant fragrance reminiscent of ripe cherries, blackberries and spices. The taste is pleasing, enduring and warm, with fresh notes. 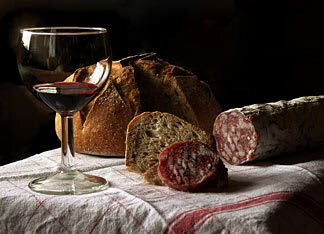 Served at 16-18 °C it is excellent with tasty appetisers, cooked meat, red meat and mature cheese. 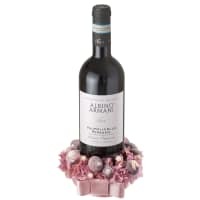 The grapes required for this wine are cultivated in the hilly and mountainous region of Marano, where the soil is made up of limestone sediments on volcanic rock. 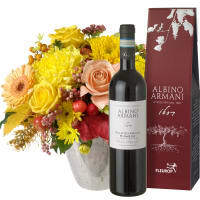 Flowers & Ripasso: visit the Shop HERE. Wine has always been a popular drink. According to the results of our survey, 93% of respondents enjoy drinking wine and 97% would give it as a gift (with 70% doing so ‘often’). 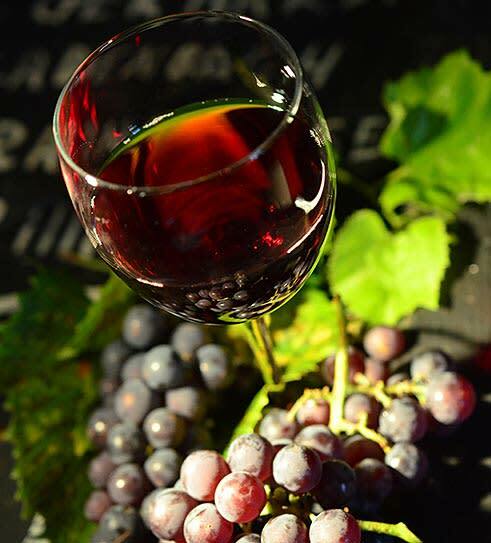 Wine is a symbol of pleasure, but also savoir-vivre and culture. 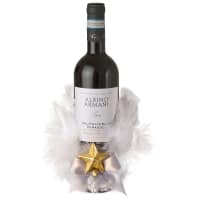 It is the perfect accompaniment for a special meal or cosy get-together. 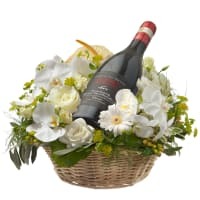 Flowers and wine are ideal companions because there are so many occasions to raise a glass in celebration and flowers simply “go well” with wine. 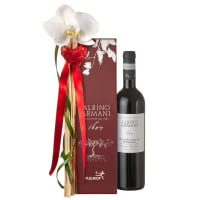 Last but not least, it’s a combination that offers a good opportunity to gift wine to a woman as well, and flowers to a man as well! Never done that before? 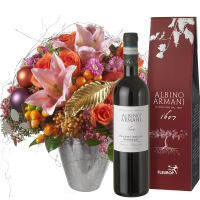 Well, you should make a resolve to present a man with a bouquet of flowers together with a bottle of wine from time to time! 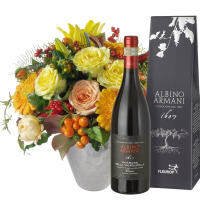 Another good idea: celebrate a wedding anniversary with flowers AND wine for your wife and enjoy the pleasure of sharing a drink with her! 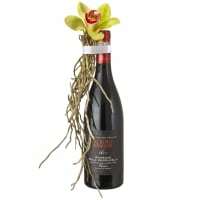 Flowers and wine are a great way to make a big impression. Flowers & red wine? Visit the Shop HERE. 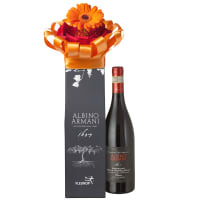 No one knows exactly when the Armani family first became involved in winemaking. 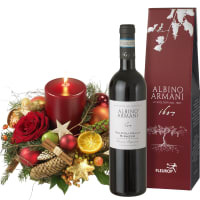 The first written record dates back to 1607, when Stefano Armani made a notarially certified gift of land with vines and trees to his son Domenico. 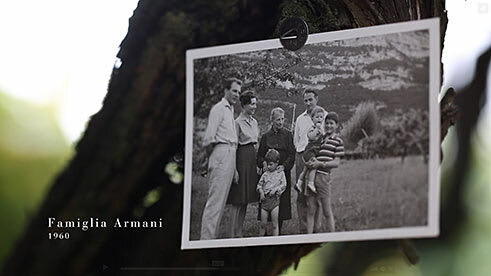 The history of the Armani family has been entwined with winemaking for over 400 years ever since then. 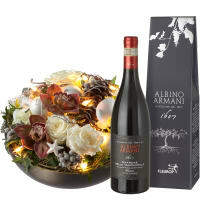 The Armani family currently own five wine estates. 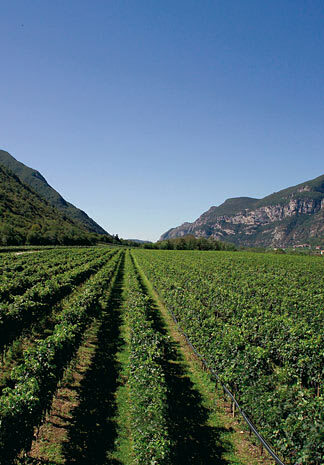 The oldest estate is located in the Trentino region where the gently sloping vineyards are well suited to growing Chardonnay, Marzemino and Schiava, etc. The estate in the Adige valley produces the excellent Foja Tonda, for example, which was threatened with extinction until only a few years ago. 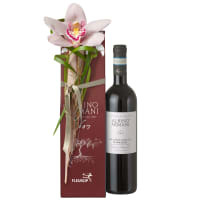 Organic wines are produced in the San Polo di Piave winery in the Province of Treviso. 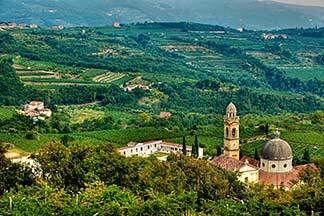 The fourth estate is located in the heart of the Doc Friuli Grave region, where our Prosecco is made. 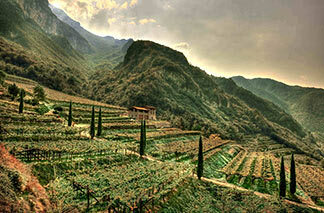 Finally, the fifth estate is the one where our two red wines, Amarone and Ripasso, are produced. 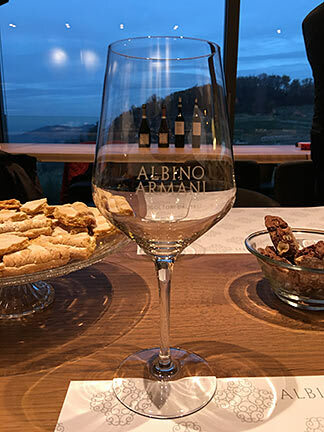 In the hilly and mountainous Valpolicella region around Marano, the Armani family’s vineyards take up the very last inch of elevated cultivable land. This ecological context provides ideal conditions for a range of indigenous grape varieties, all of which are perfectly exposed to the sun and produce wines of unmistakeable quality. 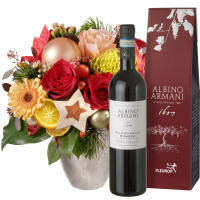 Flowers & red wine: visit the Shop HERE. 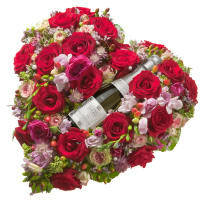 Flowers & Prosecco: visit the Shop HERE. 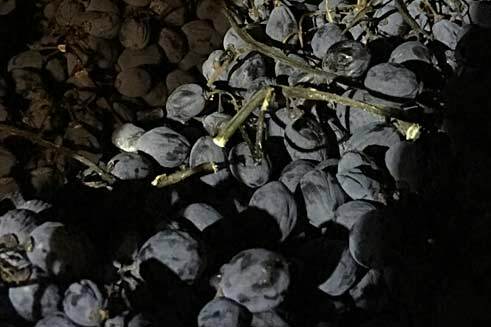 Amarone is known for its distinct aroma and wonderful fragrances, qualities deriving from the dehydrated grapes from which it is produced (see below for explanation). To set the process in motion, the best grapes are stored for three to five months after harvesting on special grids on huge shelves where they are left to dry out slowly, in a well aired environment. This phase is known as “appassimento” (meaning withering/shrinkage). The grapes are turned over, checked and sorted at regular intervals. 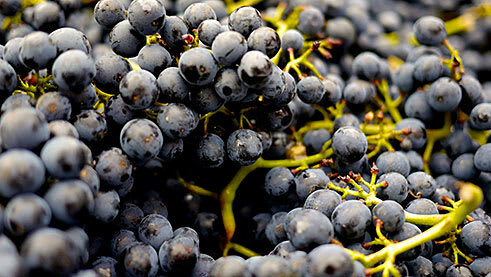 The water in the grapes tends to evaporate, leaving behind a concentrated blend of acid, sugar and extract substances. After drying the grapes are pressed and fermented, which can take anything up to 60 days. The production process continues even after that. 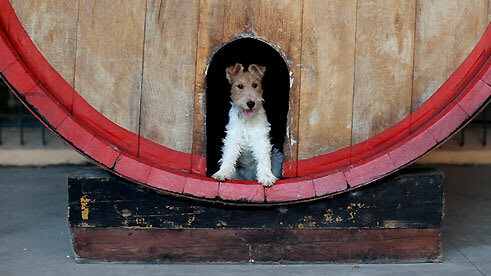 Nevertheless, the young wine is transferred to barrels where it matures for at least three years until it goes on the market. 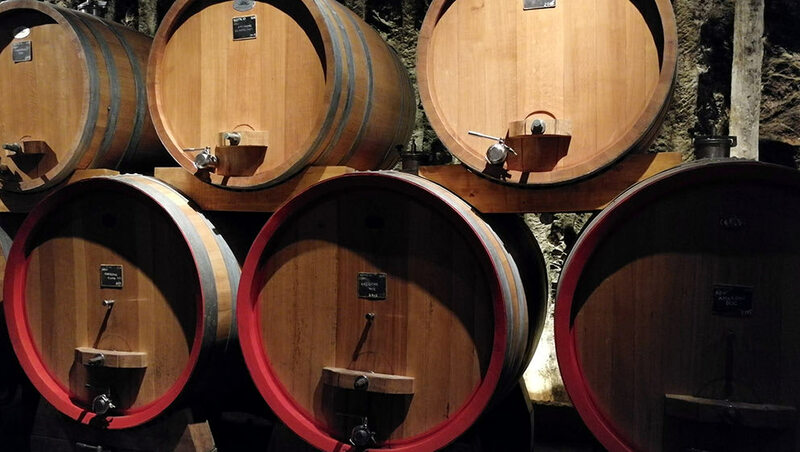 The sweet-tasting marc left over from the Amarone production process is used to make Ripasso wine. Making wine from dried grapes is a technique that dates back to antiquity. 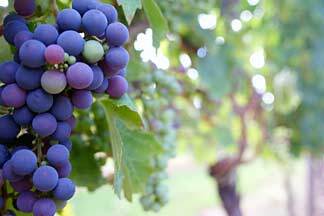 The ancient Greeks and Romans adopted the habit of twisting bunches of grapes while still hanging on the vine in order to interrupt the flow of juices, and the grapes slowly turned into raisins. 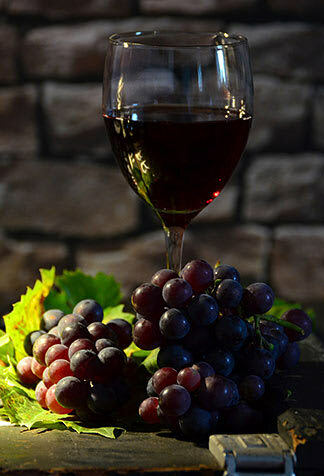 This increased the concentration of sugar in the fruit and produced delicious wines with a high alcohol content. These wines also lasted longer, so could be sold to customers further away. It is a technique that is still used even today, particularly in warm, dry southern climes – it works less well in northern Italy, where conditions are generally more humid. An alternative method was therefore developed whereby the grapes are dried in well aired barns and storage rooms or placed on reed mats or frames. 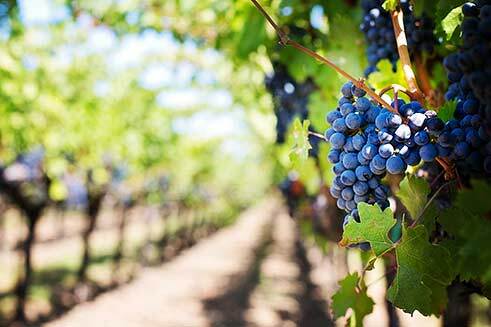 In this well aired environment, the grapes are turned over, rearranged and sorted to eliminate any which fail to meet the established quality criteria. The remainder dry slowly, producing sweet, aromatic raisins. The longer and more carefully the fruits are dried, the more concentrated the ingredients. 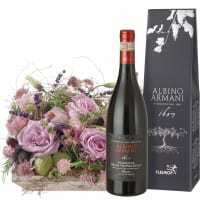 The best Amarone della Valpolicella by Albino Armani is produced from grapes which are allowed to dry almost to raisins before they are fermented. 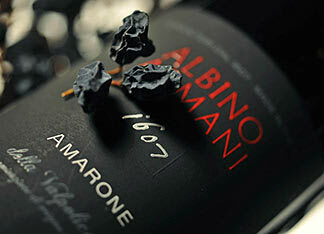 We have a forgetful 16th century cellar master to thank for Amarone. 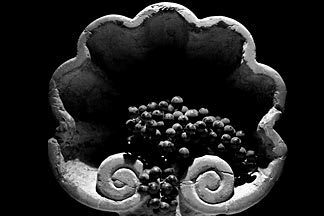 Back then, dried grapes were used to make a sweet red wine known as “Recioto della Valpolicella”, a wine that is still enjoyed even today. 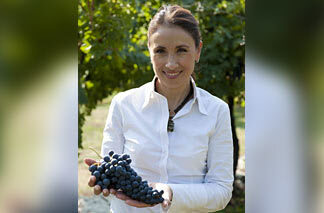 The grapes used to make this particular wine are dried even further, producing a much higher sugar content. 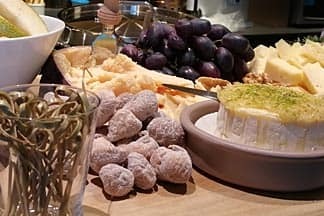 The fermentation process is also halted prematurely, so that part of the sugar remains in the wine unfermented, imparting the typically sweet flavour. The cellar master obviously forgot to stop the fermentation process underway in one of the barrels, leaving the red wine enough time to ferment completely so that all the sugar was converted to alcohol. 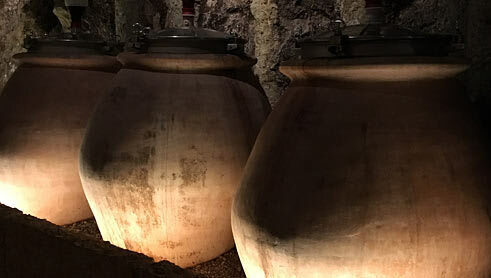 The barrel was eventually found, and the wine tasted – and Amarone was born! Dry rather than sweet, Amarone was much appreciated. It has been known as the brother of Recioto della Valpolicella ever since. The purpose of a wine glass is to highlight the colour, aromas and flavours of a wine to optimum effect. This is best achieved with colourless, uncut, thin-walled glasses with a neck that narrows towards the top. 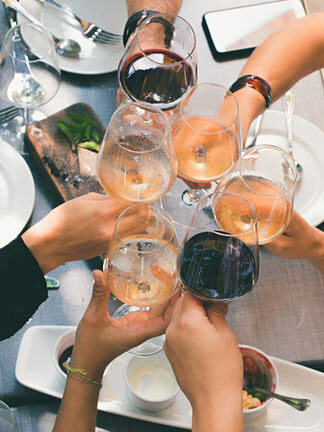 The advantage of a long stem is that one can assess the colour and purity of the wine without touching the glass itself – thereby avoiding any impact on the temperature of the wine. 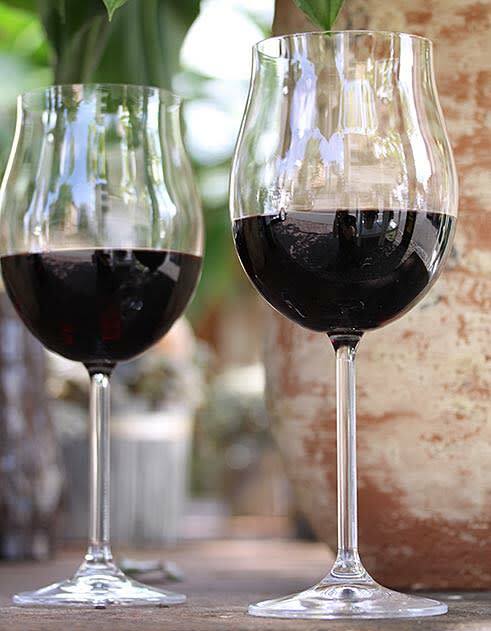 Glasses with a long stem also make it easier to swirl the wine, encouraging the wine’s aromas to unfold fully. These days one can buy a special glass for virtually all every well-known wine. But don’t worry, it’s not really necessary to take things to such lengths! Many wine lovers tend to choose a general purpose glass and save themselves some space in the glasses cabinet! 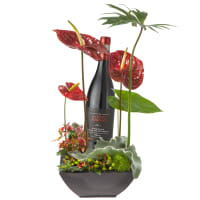 Extra-large goblets (75 cl) are best for sophisticated red wines with complex bouquets. 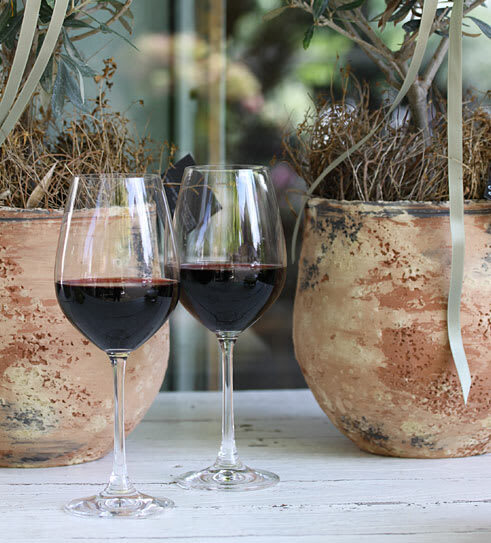 Large glasses (48 cl) are best for full-bodied red and white wines. White wine lovers will also enjoy using special white wine glasses (36 cl). Slim high champagne glasses encourage the development of bubbles. The disadvantage of champagne coupes is that the bubbles and aromas tend to dissipate quickly. 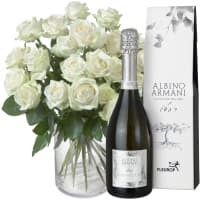 Flowers & Prosecco – with or without glasses: visit the Shop HERE. A glass should always be absolutely clean and odour-free so as never to interfere with the wine’s fragrance and flavour. Glasses should ideally be washed by hand in lukewarm water using a mild detergent. Dip the glass in the water and remove it slowly. Repeat up to five times. Only then, if you can still see traces of lipstick, wine or finger marks, should you additionally use a clean dishcloth. Then rinse the glasses thoroughly in clear lukewarm water, several times. Otherwise you may see a milky grey film form on the glasses. Traces of detergent will also detract from the tasting experience and impair the formation of bubbles in champagne glasses. Once the water has drained way, the next step is to polish the glass. 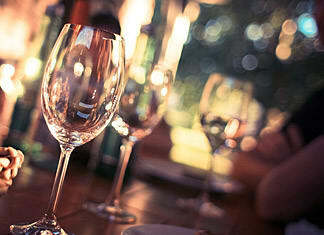 Avoid picking up and swivelling wine glasses by the stem when drying and polishing as this may cause breakage. Instead, pick up the glass at its widest point. Ideally, one should use two cloths: one to hold the glass and one to dry it. A clean cloth made from microfibre or lint-free linen is best. For an even better polish, start by holding the glass in light steam. How full to fill your guests’ wine glasses? 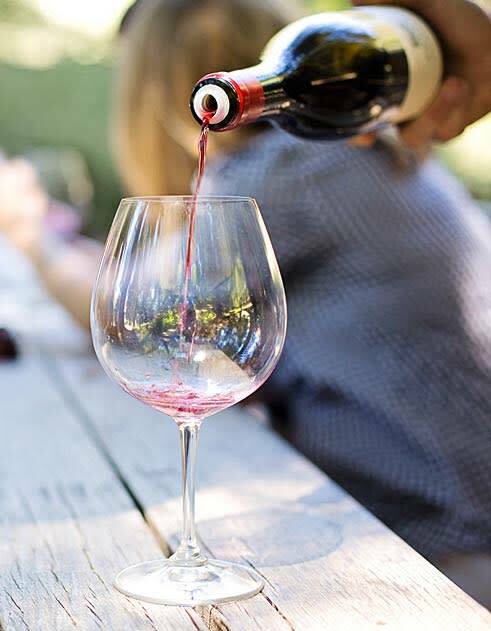 As a rule of thumb, you should aim for one-third of a standard-sized, not overly large, glass or even only a quarter full if the glass is larger (e.g. a Burgundy glass). Less is generally better than too much. If the glass is too full, there is not enough room to swirl the wine properly. Neither can the wine breathe or unfold its aromas. Not the best way to enjoy good wine! 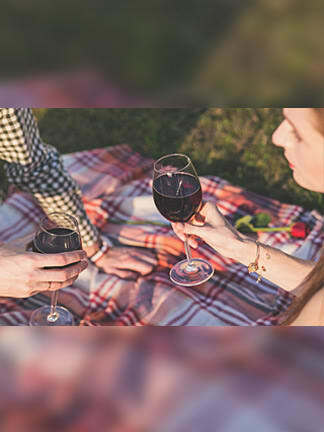 In contrast, a glass that is only one-third or a quarter full of wine can be held by the stem without tending to tilt to one side, resulting in fewer finger marks and minimising the transfer of heat from hand to glass. Champagne glasses (usually tulips or flûtes) are an exception. You can go ahead and fill a champagne glass practically to the brim without worrying about looking like a philistine! Many champagne glasses are made with what the specialists refer to as a “starting point” – a tiny point etched into the surface of the glass (usually at the bottom) by the manufacturer in order to roughen it, making it easier for the carbon dioxide dissolved in the champagne to form a bubble at that point, producing the fizz or sparkle. Transferring wine from the bottle to a carafe is known as caraffing and is carried out to aerate the wine. 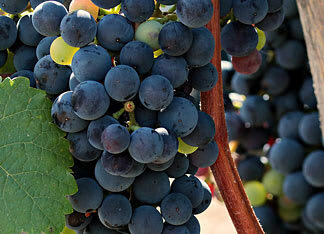 It’s a procedure used essentially for young wines made from grape varieties which are low in tannins. 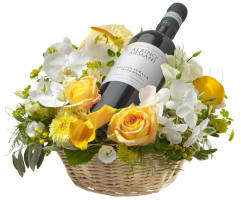 Contact with oxygen facilitates development of the wine’s aromas, and the bouquet benefits too. 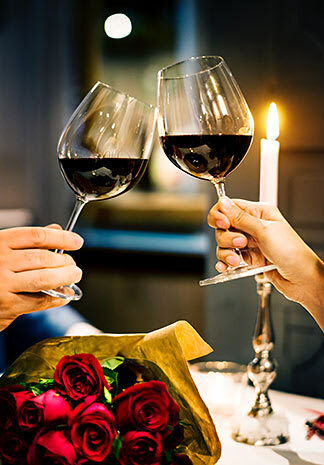 To ensure maximum contact between wine and oxygen you should use a bulbous carafe in which the wine can spread itself over a large surface, thereby coming into direct contact with the oxygen. When caraffing a wine you may happily swirl it around as you please. The important thing is to give the wine enough time to breathe – transfer to the carafe at least one hour before drinking. Older wines should not be caraffed due to the risk of oxidation, which will completely spoil the wine. Decanting refers to the process of slowly pouring wine into a decanter to separate it from the sediment that tends to accumulate in the bottle. This sediment contains many bitter-tasting substances which will also cloud up the wine. 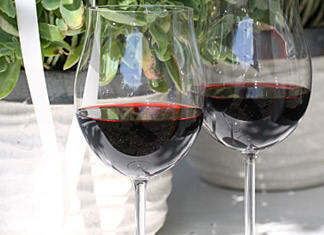 Older wines in particular may develop sediment. However, contact with oxygen during decanting, especially of older wines, may cause the wine to “turn” (i.e. oxidation with degradation of the wine as the body is broken down). 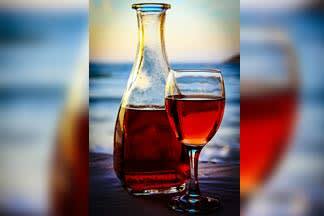 So one should use a decanter with a narrow neck to reduce air-wine contact and the wine should be poured slowly and carefully until only a few drops of wine and all the sediment remain in the bottle. Important: during decanting, take care that the wine flows along the glass wall of the decanter – this is the best technique for avoiding oxidation. If you are planning to decant a wine, you should ideally stand it upright for two days in preparation so that the sediment can collect at the bottom of the bottle. Decant only when everyone is seated at the table. It’s a good idea to hold the bottle against a bright source of light during decanting to help you spot the sediment when it reaches the neck. A candle is the traditional method, but a flashlight will do just as well. Caution: very old wines may be spoilt by decanting, even when done with the utmost care. So, if you have something rare and expensive in your cellar, we recommend serving it direct from bottle to glass. To enjoy wine at its best, it should be served at the right temperature. This is because our taste and olfactory receptors are temperature-dependent. Our sense of sweet or sour is boosted by warmth, whereas cold makes us more receptive to salty flavours, bitterness and tanning agents. So wines with pronounced acidity should be enjoyed well chilled, and those which are rich in tanning agents are better when served warmer. Sparkling wine and certain light white wines are best served cool. Generally speaking, however, and in simple terms: wine tends to warm up of its own accord anyway, so it’s better to serve a bottle too cool than too warm. A wine will gain about 2°C from the moment it’s poured into a glass. 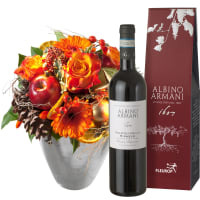 16-18 °C: heavy red wines rich in tannin such as Amarone, Bordeaux, Rioja, etc. 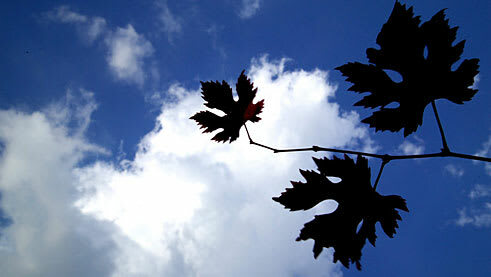 13-16 °C: young red wines low in tannin such as local Swiss wines, Beaujolais, etc. 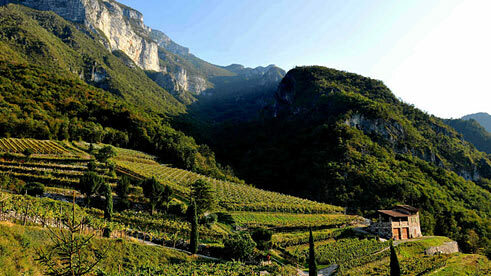 11-13 °C: complex white wines matured in barrels and well-known Bordeaux whites. 6-10 °C: all sparkling wines and champagne (the better the quality, the warmer the serving temperature). Our Prosecco is best served at 8-10 °C. 6-8 °C: all dessert wines. “Chambering” is a term that dates back to 19th century France. It is derived from the French word “chambre”, meaning room, and refers to the process of bringing a wine up to room temperature. When this term was originally in use, rooms tended to be cooler than they are now. Hence chambered wines are generally served at temperatures from 15 °C to maximum 18 °C, but certainly not as warm as we like our rooms these days, i.e. 22-24 °C. A wine is chambered by transferring it from the cellar to a cool room for a few hours before uncorking. If you need to speed things up a little, you may place your bottle of red wine in warm water. 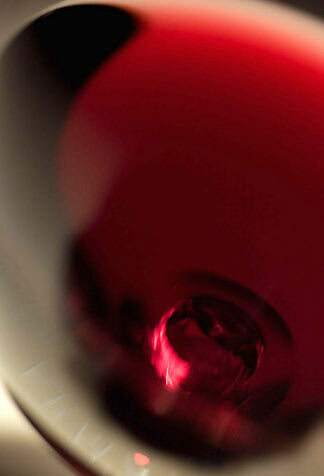 In water at 30 °C, a red wine takes just 15 minutes to warm up from 14 °C to e.g. 18 °C. Sometimes a wine (e.g. white wine, rosé, Prosecco, etc.) requires rapid cooling. In this case, your sommelier will likely reach for an ice bucket and start by adding a first layer of ice over which he will then sprinkle a large amount of salt. The bottle to be cooled is placed between the ice cubes. The sommelier then fills the bucket with more layers of ice with generous sprinklings of salt. Upon reaching the edge of the bucket he adds water. The bottle will chill within 10 to 20 minutes. Salt is essential because it causes the ice to melt and the cold which is released in this process is transmitted to the bottle, cooling it down rapidly. The water helps to cool the bottle evenly from all sides. Like to take a short tour of Albino Armani's world? Then don't miss this video with a jazzy soundtrack. 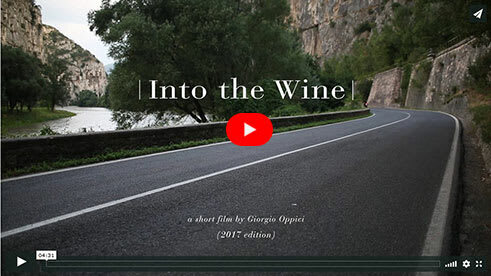 The images are powerful and dreamy: with breathtaking scenery, people hard at work, expressive faces, an osteria in Trentino, picturesque stone houses, cellars, horses and a dog who appears to live in a wine barrel like Diogenes.